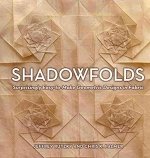 I have not tried origami in cloth so I wanted how good this book is. Is it really worth the 18 dollars for just 15 models? I have to decide between this or 'Origami Flowers: Popular Blossoms and Creative Bouquets' by Hiromi Hayashi. Which is the best between the two and which has a good variety? Well, that depends on what you want to do - fold with paper, or apply tessellation techniques to fabric. I have to admit I mostly bought the book out of interest, and because I admire Chris Palmer's work. I'm not sure I'll actually fold with fabric, but I still really appreciate the book.